If you’re not new to the world of whisky, then the George T. Stagg release from Buffalo Trace’s yearly antique collection needs no introduction. You already know you want a bottle and you already know that it will be damn hard to get one, especially these days when there is a segment of the whisky world more intent on frantically hoarding…oh, I’m sorry, I meant “energetically collecting” bottles of this kind rather than drinking them. And no, this is not sour grapes or jealousy, this is just me getting tired of people being more excited about having a bottle, or bottles, of a certain whisky than being excited to actually drink what’s inside the bottle. If it makes you feel special, go ahead and buy up a case of whatever it is you think is so rare, then feel special again when you sell off a few bottles from the case a few years later at a profit to some poor sap who wants to feel special by buying up some bottles of what he thinks is rare. In the meantime, I will be here actually drinking the whisky and truly enjoying what’s in the bottles I open, finish, and then casually toss into the recycling. Dammit, you people! Ok, sorry, where was I? George T. Stagg…if you know all about it, then you know all about it and you can skip ahead or doze off for a few minutes or whatever. If you don’t know about George T. Stagg, let me just start by saying that this bourbon, this un-cut, un-filtered, sky-high-proof bottle of Kentucky’s finest, was on one occasion directly responsible for a good and devilishly handsome friend of mine missing not one, but two flights the following morning. It’s an approximately 18 year old yearly touchstone of the bourbon world, pretty much always truly excellent, and you owe it to yourself to, at least once in your life, hunt some down and torture your liver with it. I hope I’ve given you the impression that George T. Stagg is fairly epic stuff because it really is one of the few whiskies that actually live up to all the surrounding hype. Unfortunately, as I’ve mentioned, it’s a hard one to get a hold of. What are the rest of us, the hoi polloi, the great unwashed masses, supposed to do if we don’t want to spend lots of time and lots of money in the pursuit of a bottle of George T. Stagg but still want to get in on some of Stagg bourbon goodness? Well, beginning this month, there’ll be an answer to your prayers on booze store shelves…Stagg Jr. The folks at Sazerac and Buffalo Trace are certainly no fools, indeed they’re arguably the most broadly innovative bourbon makers we’ve got and they also know a good money-making brand name when they see one. Nine years ago, they knew another Stagg release would be a hit and they began laying down the barrels to be used for Stagg Jr. Junior will be released throughout the year in small batches approximately 8 – 9 years old, and like its paterfamilias, will be released at barrel strength, un-cut, and un-filtered. Now, for those that are wringing their hands over whether or not the barrels plucked for Stagg Jr. will impact Stagg Sr. stocks for future releases, just settle down, the barrels earmarked for the Antique Collection releases will not be touched for this younger expression. The Nose: Very similar to Stagg, the Elder., though surprisingly a little softer seeming. Loads of vanilla bean and butterscotch with tupelo honey overtones along with cinnamon and sugar mix, cherry cola, and popcorn. 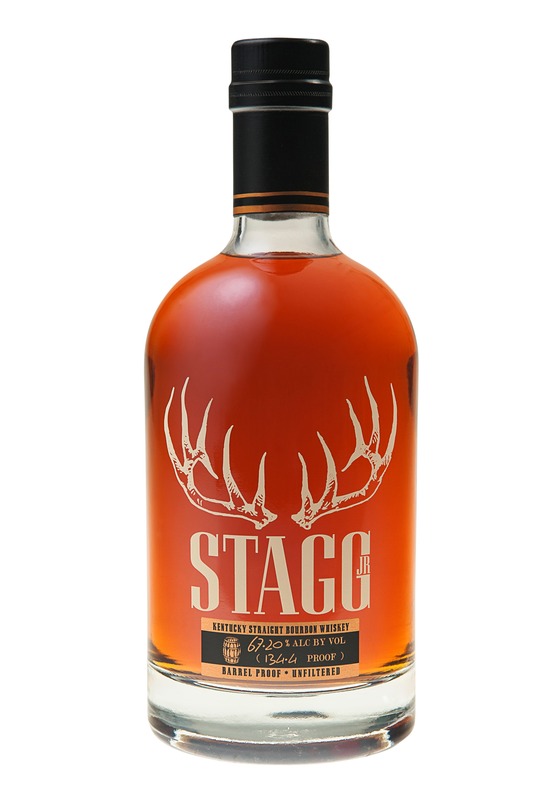 Nice mocha notes and more spicy rye – think toasted rye bread – than Stagg Sr. Behind these initial sweeter elements are more delicate hints of corn oil, slightly green banana and barrel char. Lots of cinnamon, polished oak, and a bit of tobacco leaf loiter in the background as well. Adding the necessary water simplifies some of the sweetness but plays up the corn, the rye, and the wood a bit more. The Palate: (High proof stuff like this always makes me think of that Jack Nicholson scene in Easy Rider.) Not as smooth as Stagg Sr. initially, but similarly lean and muscular. Baker’s chocolate, slightly burnt popcorn, and juicy orange lead that first overpowering wave. Lots of spicy rye and hot cinnamon appear early and continue to steamroll through to the finish. They’re joined by more vanilla bean, charred oak, drying clove, and a bit of black pepper. There’s a bit of greenish tobacco leaf that carries over from the nose as well. Adding about a half-gallon of water to my Glencairn glass added a little fudge-y chocolate and played up the rye and burnt corn char nicely, while also toning down the tannic, drying, peppery wood notes. The Finish: A bit quickish and quite drying. More unsweetened chocolate, coarse vanilla bean, burnt popcorn and toasted rye. Thoughts: Damn good stuff, though try as I may, I can’t help but compare the Stagg Jr. to the George T. Stagg, which is unfair because they’re obviously very different bourbons. Still, the lineage and the intent is there, so comparing the two is pretty much inevitable. There are similarities to be sure; the eye-brow singing alcohol content, the willingness to showcase the rougher elements of bourbon, and of course the flavor profile to some extent. Aside from that initial sweetness on the nose, Stagg Jr. comes off a bit more raw, not necessarily in a bad way, it’s just a rougher chip off the old block, if you will. It doesn’t quite integrate its strength as well. The nose is nicely complex both with and without water, while the adventuresome palate definitely benefits from a little h2o. I tend to like rugged bourbons like this, in fact, at times this reminded me of another un-cut/unfiltered gem, Booker’s. I’m inclined to say this one is worth its $50 price tag, though it is something of a challenge. It will satisfy fans hoping for more of an “everyday” Stagg and will make happy drinkers out of those of us who like the Antique Collection release but would prefer something a bit more accessible. Definitely Recommended.